Jack Holder begins his bid to become Peterborough’s second national champion tonight (January 4). The new ‘T Balfe Construction’ Panthers recruit lines up in the opening round of the Australian Championship at Gilman. 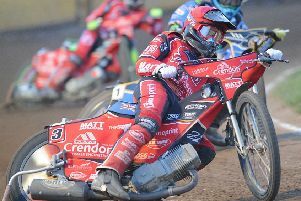 Holder, who will start the 2017 season as Peterborough number one, will be out to improve on his seventh-placed finish last year. The four-round series continues at Mildura on Saturday and Undera next Wednesday before coming to a climax at Kurri Kurri on January 14. While top names such as World Championship runner-up Jason Doyle and Holder’s older brother, Chris, are sitting out their national series, there is still a classy field taking part. World Under 21 champion Max Fricke, reigning champion Brady Kurtz and Sam Masters will be among the favourites for glory. Panthers already boast one national title-winner after another of their new signings - Bradley Wilson-Dean - roared to glory in New Zealand before Christmas.